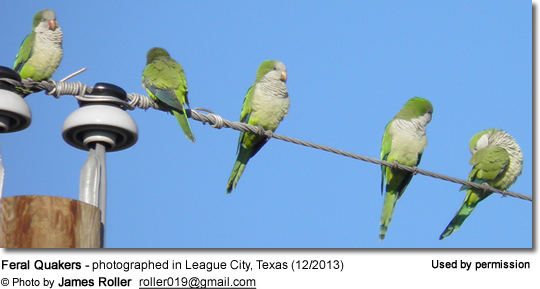 The Monk or Quaker Parakeet has established feral colonies around the United States, where they are most common in southern Florida and southeastern Texas. Colonies have also established themselves in Alabama, Cincinnati, Connecticut, Delaware, Illinois (Chicago), Kentucky (Louisville), Louisiana, New Jersey, New York City, Oregon, Puerto Rico, (coastal) Rhode Island, Texas and southwestern Washington. 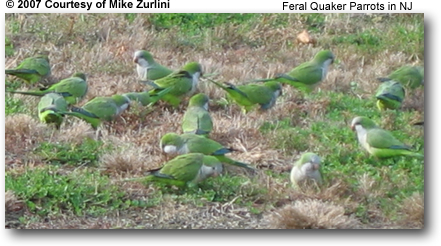 When I moved to South Florida, I was delighted to see the large population of wild Quaker Parrots (sub-species of the Monk Parakeet) who have made this their home. They are not indigenous to this area -- and are escaped or freed pets or breeder birds. You can see them making their nests along the streets (they like the very tall lamp posts and electrical installations, the latter of which is one of the problems municipalities have to deal with). They will also nest in trees, especially palm trees. They are common, and noisy, visitors to backyard bird feeders, where they are typically seen in groups. Bird lovers treasure them, while others consider them pests. In fact, they are illegal in several U.S. states, as they are considered agricultural pests.